If silage is not correctly packed into a bunker (or bagged or put in silos), oxygen will remain in the pile which leads to greater shrink losses. Photo courtesy of Troy Walz. If silage is too wet, you will have considerable drainage, and maybe even incorrect fermentation. Conversely, if silage gets too dry, it will be hard to pack and remove the oxygen during storage, which can lead to greater losses, spoilage, and perhaps incorrect fermentation. Ideal moisture is 35 to 40% DM or 60 to 65% moisture. For optimum feeding performance, there is some evidence that 37% is a good target. The challenge is knowing the moisture while corn is standing in the field. If silage is not correctly packed into a bunker (or bagged or put in silos), then oxygen will remain in the pile which leads to greater shrink losses. A good target is 15 lb of DM per cubic foot, or about 45 lb of as-is silage per cubic foot. The best way to judge this is to calculate the approximate amount of tonnage and height your bunker should be based on the dimensions. If you are off target, then you are likely not getting sufficient packing. A good rule of thumb is to pack 3 to 6 inches of loose silage at a time. Don’t overfill bunkers with several feet of loose silage before deciding to pack with tractors or packing equipment. You should always cover silage stored in bunkers with plastic. Numerous options are available including oxygen barriers and different thicknesses. Consider the bunker you have and how best to cover. If you are making bunker sides with permeable materials (hay bales for example), then you should wrap sides and tops in plastic. If the bunker is not covered as soon as possible (within 24 hours or so), you lose material the entire time the pile is exposed. How you manage the surface of the silage pile matters the rest of the year. The size of your pile or “face” of the bunker also matters. A rule of thumb is to be able to remove 6 to 8 inches from the entire surface of your bunker daily. That means if you have a relatively small number of cattle or silage amount being fed daily, then you need a smaller face to manage. Generally speaking, most bunkers are too wide for the height. You should not remove more than one day’s worth of silage each day if you can avoid it. Loose silage at the bottom of the bunker face should be minimized daily. Fatalities have occurred from silage falling on someone sampling or working around the face of the bunker. Proper bunker height, face management, and removal of plastic from the top of the bunker are important safety considerations when feeding silage. 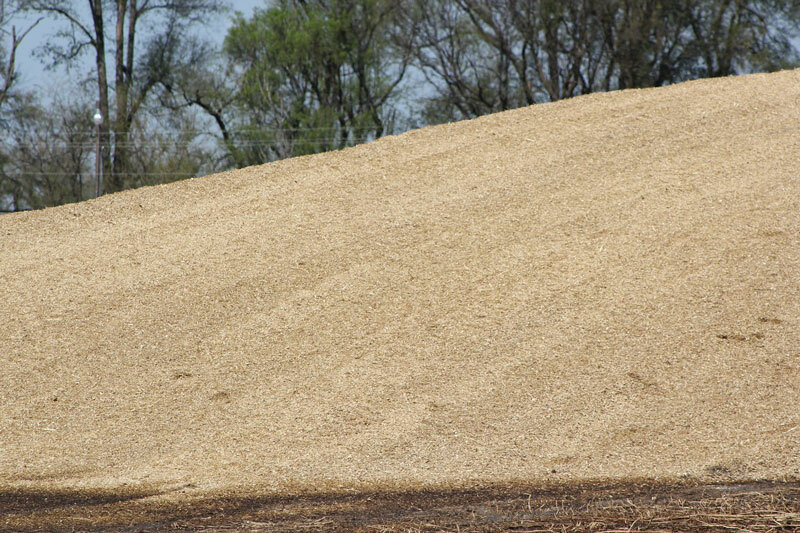 Once silage is put in a pile, it is always a good idea to sample that pile after three to four weeks (when ensiling is complete) to test for energy content, pH, and moisture. Silage tests can be done to illustrate how well fermentation proceeded during ensiling. If nitrate is a concern, testing should be done after ensiling. Ensiling will decrease the nitrate content from the originating feed, but still may be a concern. This is especially concerning when feeding silage to pregnant cows. If the considerations mentioned above are ignored, feed losses or shrink may be increased. It is recommended that shrink be measured on all feeds by quantifying total wet tons put into the bunker and sampling at harvest for moisture content, so tons of DM put into the bunker can be quantified. Total weight removed at feedings is also required which includes periodic moisture testing (sampling from many spots in the face) and quantifying wet tons or pounds fed on a daily basis. If shrink is managed well by following these considerations, shrink losses should be less than 15%. If shrink increases above 15% (meaning you have less than 85% of the dry material fed compared to dry material you put in the bunker), then silage is likely not an economical choice for you to feed to cattle. However, we encourage producers to measure shrink on hay as well considering shrink is unavoidable on most feeds producers are using. Pricing silage accurately is also important so cost of production is known. Silage is a very economical feed for growing and finishing cattle in integrated corn-cattle operations if: shrink is less than 15%, silage is fed with the correct protein supplementation (such as distillers grains), and manure from cattle are used on acres cut for silage. If you cut silage, the use of cover crops is often an option that provides further feed resources for grazing cattle and is a current research and education topic. More information is available on the Silage for Beef Cattle Conference page where you can download much of this information and see videos from experts in many of these areas. Pay special attention to the shrink and safety discussion by Dr. Keith Bolsen.